User Name: Password: Register | Lost User Name/Password? The Legend of Zelda: Ocarina of Time​ is an action-adventure video game developed by Nintendo's Entertainment Analysis and Development division for the Nintendo 64 video game console. It was released in Japan on November 21, 1998; in North America on November 23, 1998; and in Europe on December 11, 1998. Originally developed for the Nintendo 64DD peripheral, the game was instead released on a 256-megabit cartridge, which was the largest-capacity cartridge Nintendo produced at that time. Ocarina of Time is the fifth game in The Legend of Zelda series, and the first with 3D graphics. It was followed two years after its release by the sequel The Legend of Zelda: Majora's Mask. The player controls the series' trademark hero, Link, in the land of Hyrule. Link sets out on a quest to stop Ganondorf, King of the Gerudo tribe, from obtaining the Triforce, a sacred relic that grants the wishes of its holder. Link travels through time and navigates various dungeons to awaken sages who have the power to seal Ganondorf away forever. Music plays an important role—to progress, the player must learn to play and perform several songs on an ocarina. The game was responsible for generating an increased interest in and rise in sales of the ocarina. Ocarina of Time's gameplay system introduced features such as a target lock system and context-sensitive buttons that became common elements in 3D adventure games. In Japan, it sold over 820,000 copies in 1998, becoming the tenth-best-selling game of that year. 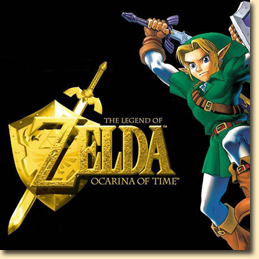 During its lifetime, Ocarina of Time sold 1.14 million copies in Japan, becoming the 134th-best-selling game of all time, and has sold over 7.6 million copies worldwide. The game won the Grand Prize in the Interactive Art division at the Japan Media Arts Festival, won six honors at the 2nd Annual Interactive Achievement Awards, and received overwhelmingly positive acclaim. The title is considered by many critics to be the greatest video game ever made. Can't find what you are looking for? Please visit our Most Wanted section an request an item to be added to the site!